The lightweight and sturdy Boardman bike is made of aluminum, with an endurance-to-weight ratio that makes it ascend quickly and handle well when going downhill. Therefore, you can ride the bike over washes, down steep hills, over dirt paths and across gravel roads with confidence. Both recreational riders and competitors have come to depend on the reliability of the Boardman name. The high-quality disc brakes on the Boardman bike make the cycle optimally responsive and safe in all kinds of situations. In addition, the MTB maintains 20-speed gearing for exceptional shifting performance too. This mtb features superb qualities; from its 6061 triple butted alloy frame, 120mm travel RockShox Recon Gold TK fork and SRAM 2×10 20 speed gearing, everything that are specially designed for more adventurous and serious trails for cyclists. With the blend of all these specifications, and produced by one of the world’s leading bicycle brands, comes up a very versatile bike that you can use from neighborhood strolling to race track driving. This awesome bike has Continental Mountain King 26” x 2.2” tires; it really is a royalty among the bike kingdom! The bike is really very professional in looks and performance. It has powerful Avid Elixir 3 Hydraulic disk brakes for a more reliable and perfect breaking performance. Also, this bike is the most ideal for off road performances, for the Boardman Team bike is very much designed for that specific purpose. The Boardman Team MTB has gained its popularity among cyclists and bike enthusiasts. According to its bike reviews, it has a superb quality, perfect for your off-road adventures. It is also very light, with its weight of 25.5lbs; it is light as a feather! From its users themselves, they admit that the price for which they bought this bike is very reasonable, they get the high quality performance they are looking and they have not been let down by this bike even for once. Also, with its bold decals, great quality specifications, new frame tubing and perfect warranty, makes every bike owners satisfied with their own Boardman mountain bikes model. But, from other users, what they complain about the Boardman bike is its dull look. They say that with its grey color, it doesn’t really standout with its looks. Another also suggested that it would be better if these bikes have their own bell, like ordinary bikes, to signal a warning other pedestrians whenever they are coming through. All in all, if you want to feel professional, you ought to buy this Boardman Team MTB. Looks are not that much important, even if it has dull looks, what is important is its performance. This mountain bicycle is really what every bicycle enthusiasts and professional cyclists look for. You can never go wrong with this Boardman bike. And, what can you expect from a bike that has been specially designed and inspired by an Olympic Champion Cyclist? A good quality and professional performing bike, of course! So, what are you waiting for? 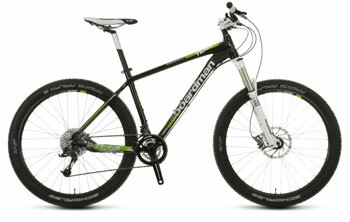 Find more reviews about this Boardman Team Mountain Bike on Halfords here.